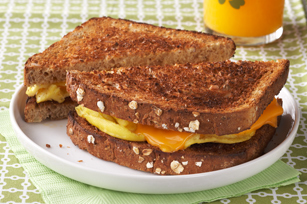 Scrambled eggs are a breakfast staple, but put them between two slices of toast with a KRAFT SINGLES Light Cheese Slice and you've got a portable breakfast with a twist to get you out the door in minutes. Fill toast slices with egg and Singles. Serve with a Del Monte Orange Tangerine 100% Juice Blend.